OwlCon 2016 has come and gone, we hope you all had as much fun over the weekend as we did! This year we scarfed down tons of junk food, made lots of new acquaintances, ran a few sessions of Cards & Quests, and officially premiered Bureaunauts. 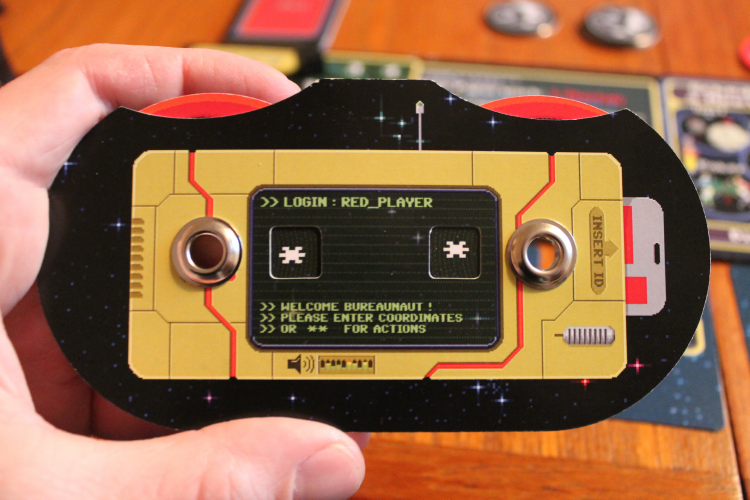 Thanks to everyone who played our games and the great feedback you provided. We’re already looking forward to next year! •The Erinyes can use a long whip to knock down one opponent, which must use the next Move or Skill Phase to stand up to attack again. While on the ground, the victim can defend itself but not attack. •If the Erinyes is guarding something secret, she will make an illusion that protects and hides the object. Killing the Erinyes does not necessarily dispel the illusion and a character must use Detect Magic or a Mental Attribute Check to identify or eliminate it. Duration: Illusion lasts one month before fading. These vengeful spirits are native to outer planes like Hades and Tartarus and generally take the form of enraged, winged women armed with swords, daggers, bows, whips, or ropes that they use to entangle victims. 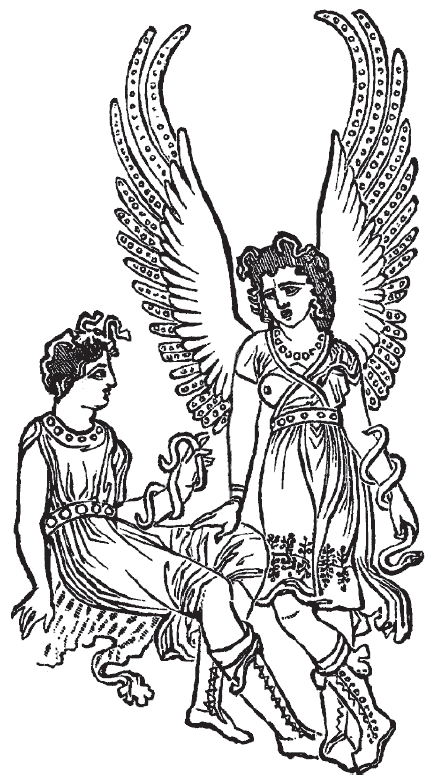 Erinyes are often used as guardians of secret, sacred, or profane places, are dispatched by deities of all alignments on special missions, or are summoned by powerful spellcasters in pursuance of their own ends. The Erinyes and 50 other monsters of the Classical world can be found in the Cards & Quests Bestiary 1: Monsters of Kos supplement. All of the monsters presented in this fully-illustrated, 42-page manual are associated with the system-free Swords of Kos Fantasy Campaign Setting and can be easily incorporated both into games that use it or other settings altogether. 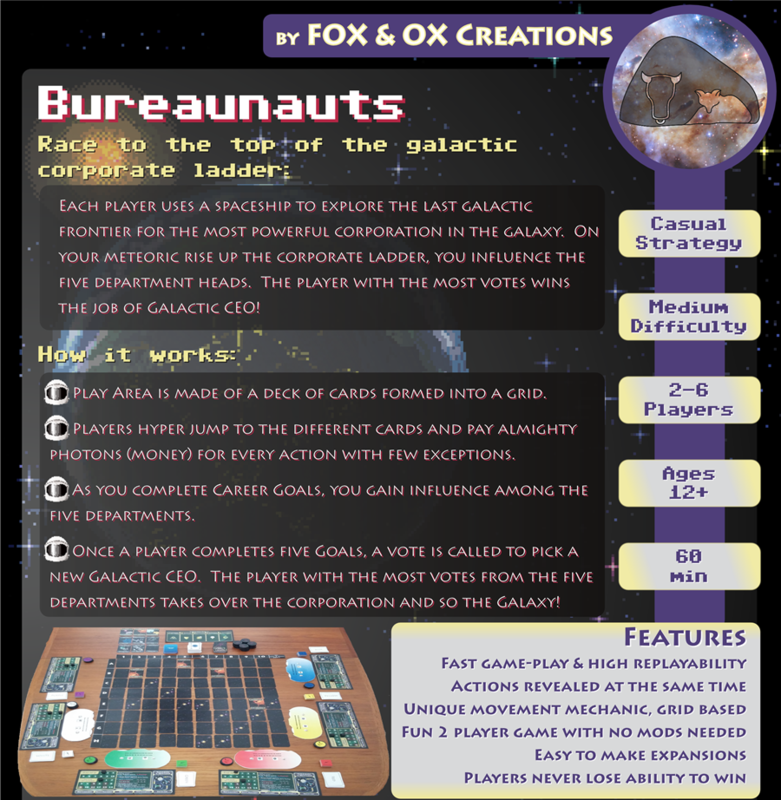 Here’s a little preview of our very first board game, Bureaunauts! 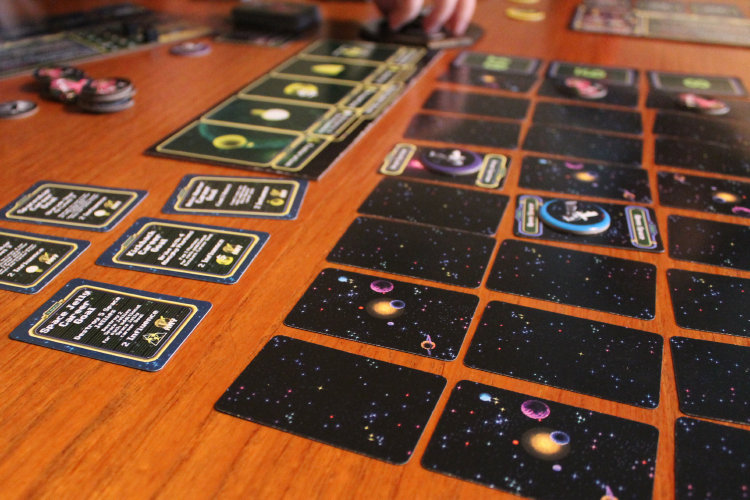 Get ready to explore the Universe and climb the corporate ladder, while fighting intergalactic pirates and space jellies! 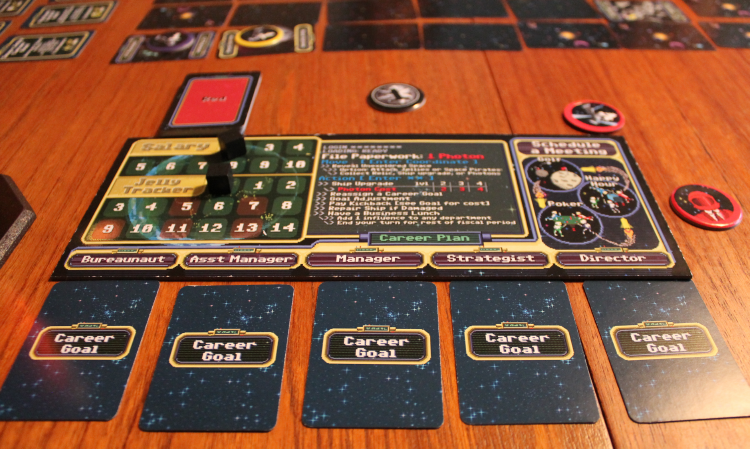 You might even become the galaxy’s new CEO! 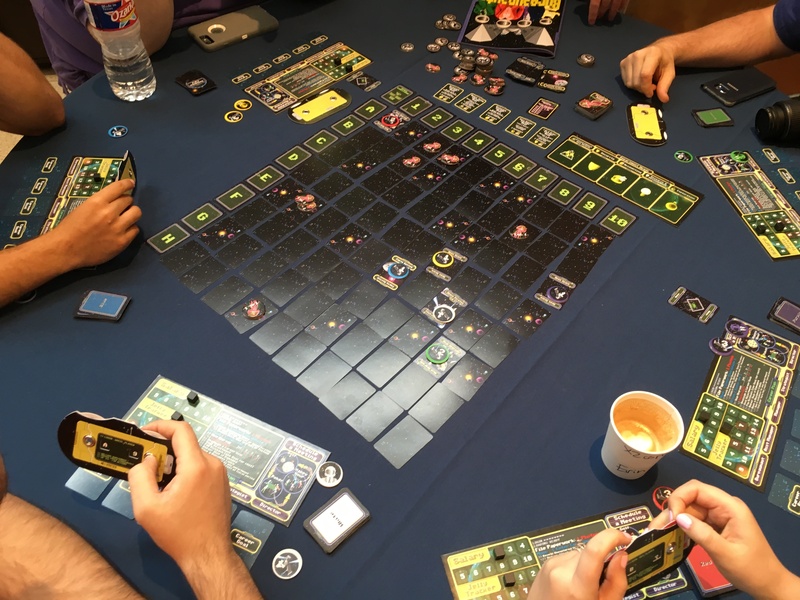 Come play a game or two yourself at this year’s at OwlCon! It’s official! OwlCon 2016, here we come! We’ll be at the Skirmisher exhibition booth, as well as running Cards & Quests adventures Friday and Saturday night! Hope to see you all there! An adventure outline for the Swords of Kos setting. The characters are spending a leisurely afternoon at the Four Winds Bar in the city of Kos when they witness an unusual sight. An elderly woman hobbles through the tavern doors to the bar’s notice board, where she pins up a small placard and hobbles back out. Overcome with curiosity as to why an old woman would need the service of sellswords, the characters examine her note. It reads that she has seen “lights and little men” at night in the abandoned warehouse adjacent to her home in the Slum Quarter. Concerned, she reported it to the town guard, who haven’t looked into the matter. She offers to pay 3 gold pieces and a hot meal to anyone willing to investigate. While most of the bar’s patrons laugh off the old woman’s note as senility, the players either have their curiosity piqued or take pity on her. The old woman is not senile and the “little men” she has seen in the warehouse at night are goblin operatives from the Tetrarchy of Anatolia. They’ve slowly been tunneling through the floor of the abandoned warehouse down to the sewers, which open into the Bay of Kos, to create a concealed pipeline into the heart of the city. If the players manage to take any of the goblins captive, they will initially claim to be smugglers, but their finely crafted equipment and weapons will betray them as military agents. Further interrogation will reveal that these goblins are part of a group based in Pserimos, which is ripe for the characters to raid. Fire Deck along with the 7 other element decks are now available online! We will have a table in the dealer room at ApolloCon and we will be running two Cards & Quests events on Friday the 19th at 8PM and Saturday the 20th at 2PM! Though we have not attended this convention before, we think it overlaps nicely with our first game. We are looking to meet other fiction writers and fellow gamers in the Houston Area. 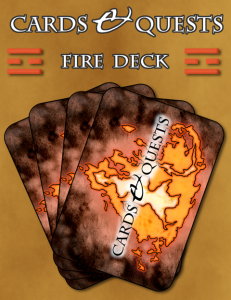 In other news, all eight custom element decks for Cards & Quests are now available online at Drivethrurpg.com! Our publisher, Skirmisher, has done an awesome job getting this online. We will be working to release a new Game Master deck that has helpful tips and rules. We are hard at work at Fox & Ox headquarters in the run up to ComicPalooza. 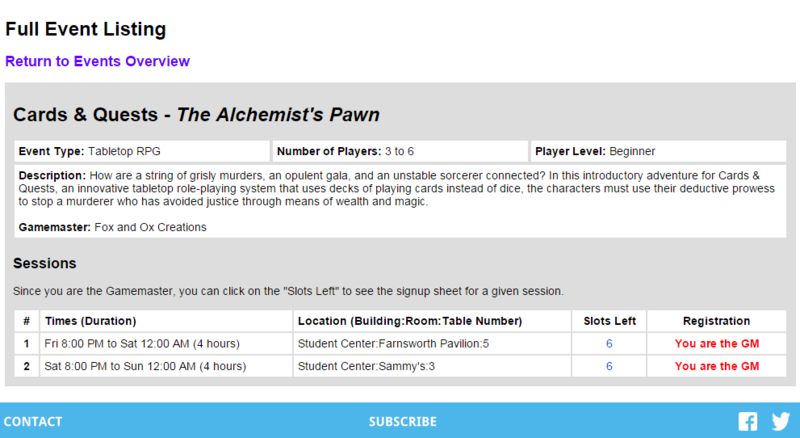 We have ordered 2 new banners, one of which we will be using at ComicPalooza for the Cards & Quests demo area. We’ve also finished making all our pre-generated characters that we will be using for the demos. We have 8 characters each representing one of the Primary Elements (elements are like skill sets) available in Cards & Quests. All of these characters are made to be used in the awesome Swords of Kos Fantasy Campaign Setting. This fantasy setting is robust and allows for all aspects of Cards & Quests to be played out. Hats off to Skirmisher Publishing for making such a well-rounded and interesting backdrop for adventuring! On May 14 at 8 PM CST, I’ll (Allison) be on the d-infinity webcast discussing character creation. It’s my first time on any webcast, so hopefully the internet camera is forgiving. I’m excited to be joining the d-infinity crew and happy to be invited as a guest! Fox & Ox Creations now has a blog under our username Allison and Todd Markello. The first post is about how we came up with Cards & Quests. Check it out! Cards & Quests now available!! We are excited to announce the release of Cards & Quests on Amazon.com for the paperback book, DriveThruRPG.com for PDF, and RPGNow.com for PDF! This is our first big release and we are organizing to be ready for ComicPalooza in Houston. Special thanks to everyone who has playtested and supported us over the years and to Skirmisher Publishing. Without you, we wouldn’t have gotten to this point. We are so excited to have Cards & Quests finally in print! Big News for Cards & Quests! Cards & Quests will be published by Skirmisher Publishing LLC! The release will coincide with ComicPalooza, the Texas International Comic Con. We will be located in Room 320 C of the George R. Brown Convention Center demoing this new RPG during Memorial Day Weekend. We are ecstatic to be working with Skirmisher to release Cards & Quests. Stop by to say ‘Hi’ and check out the game!! The new Little Orc Wars video game will also be in the Skirmisher Pavilion. You will be able to play each other on a side-by-side projectors with your catapults and armies. We are looking forward to a really fun event this year!